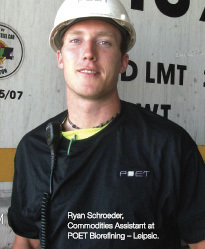 Commodities Assistant Ryan Schroeder, POET Biorefining – Leipsic in Ohio, found the solution to a problem with innovation and ingenuity. 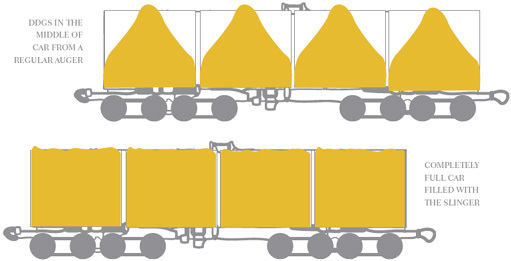 Nicknamed the “slinger” and offering a significant cost savings for POET, this patent-pending invention eliminates the physical labor component of loading rail cars to capacity with Dakota Gold dried distillers grains with solubles (DDGS) and saves shipping costs by more effectively filling the rail cars. During the current loading process, the DDGS fills the center of each of the four sections first, creating a cone shaped pile up. Commodities assistants, like Schroeder, then shovel the product toward the sides of each section to reach capacity and maximize shipping costs for the rail car. Modest and soft-spoken, Schroeder explains the slinger came out of necessity last summer. “It started getting hot, and there was a lot of sweat coming off me. I decided there had to be a better way. I wanted to be able to load DDGS as quick as I could,” he says. Attempts had been made to find a feasible solution. “I knew they were working on something to make it easier. After loading and watching how things worked, it just kinda came to me. … It was the beginning of summer when it was implemented, and not long before that I was dreaming the thing up,” Schroeder says. Last Spring, Schroeder turned the idea into formal plans and worked with Precision Laser, a local manufacturer, to fabricate the device that would house the internal components, of the slinger. Mark Borer, General Manager at POET Biorefining-Leipsic, is no stranger to invention, but Borer has never seen such ingenuity and initiative from a team member. Hitting it on the first try, Schroeder’s original slinger, aptly named because it slings the DDGS to the sides of the rail car, is the first prototype built after planning its design. The original design leveraged use of an auxiliary hydraulic system while the permanent model, which is now in place at POET’s Leipsic plant, uses a stand-alone unit. Schroeder also participated in the trial process at the plant and helped assemble the product as it is used at the plant today. “After implementation of the first design we added a few things to keep the product and dust down in the car, as well as on the back,” adds Schroeder. The primary upgrade to the design involves a switch that precludes the motor and blade from turning unless the unit is sitting on the rail car. While the savings in shipping and labor costs for POET are significant, the increase in employee safety is a critical aspect of running a balanced business, as well. The slinger and its creation truly inspired POET’s team members. “It was exciting see the slinger operate. It is a basic design but serves a very important purpose,” says Rod Pierson, Director of Plant Operations, POET, Sioux Falls, S.D. “As far as Schroeder coming up with the idea and taking the initiative to do it on his own, goes a lot toward the spirit of POET. That’s the type of people we want to have at POET – people that are always thinking of new ideas and taking the initiative to develop those ideas.” The reaction to his invention from his peers is very rewarding to Schroeder. “It felt good knowing that not just our plant would benefit, but the commodities guys at all the POET plants would benefit,” he says. In fact, Schroeder encourages others in similar situations to use past experiences and to work toward the best possible result. “I thought it out for a long time before I tried. Think it through before throwing something together and ending up with a headache,” he says. As to the plant’s reaction, Borer adds, “It was kinda like a light bulb going on. Everyone immediately said, ‘This is going to work. It’s fantastic.’ You never really know how robust a new machine is going to be at the start, but it’s proven itself to be extremely robust. All the plants have embraced it. I’ve had general managers call me from the other POET plants and say ‘I would love to have one. When is it going to be available? What do we need to do to get one?’” Knueven hopes to see Schroeder’s invention at every POET plant shortly. “It’s great to see a project like this where a team member takes it upon themselves to recognize a need and come up with a solution,” adds Borer. “Ryan took it upon himself to build the slinger. I’ve not seen it taken to that level before. I would call that extraordinary,” says Borer, noting the adage ‘necessity is the mother of all invention’ holds true in this situation. Schroeder’s design now features improvements, and efforts are underway to protect the intellectual property. Currently, POET is going through the process of patenting this invention. Ideally, mass production of the unit, with its enhanced features, would be available for all 26 POET plants. He adds that the slinger is a perfect example of what can happen when a team is engaged, willing to contribute and thinks about how the process can be improved. “It was a very pleasant surprise when I got the call to come out and see his work. The first time I learned of it – it was a finished project in-use,” says Borer. Knueven sees the slinger as a true representation of Schroeder’s go-getter and get-it-done attitude and an embodiment of POET’s ideals. “Ryan and the whole team were looking for a way to accomplish the task of loading the cars in a safer and more efficient manner. He came up with this, and it says a lot about Ryan and our team. They are thinking outside the box and finding ways to get it done,” say Knueven. Ashley G. Williams is a Chicago-based freelance writer. When not writing about business and technology, she enjoys the torture of being a Cubs fan along with her husband and dog, appropriately named Wrigley Bear.